The Strategic Transport Fund won a prestigious award for the 'Most Innovative Transport Project of the Year' at the annual Scottish Transports Awards held in Glasgow yesterday (20 June 2013) . The Strategic Transport Fund was prepared in partnership with Nestrans, Aberdeen City Council and Aberdeenshire Council, with the support of Transport Scotland. It forms non-statutory supplementary planning guidance adopted by the SDPA in 2012. 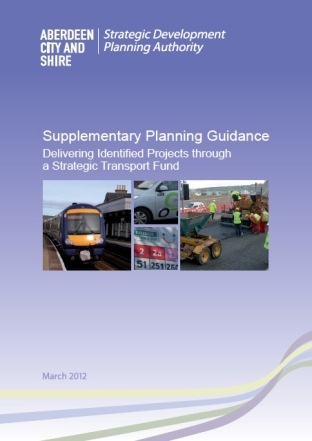 Work on the Strategic Transport Fund involved a long period of assessment and collaboration between all partners. The outcome of this was guidance designed to support development by establishing a mechanism to deal with the cumulative impacts of new development on the transport network. The Aberdeen City and Shire Structure Plan (2009) highlighted the importance of dealing with these issues given the scale of development planned for the area over the next 25 years. The proposed Strategic Development Plan also highlights the significant contribution the Strategic Transport Fund will make to delivering the growth aspirations of the area. The Strategic Transport Fund has been operational since early 2012 and is successfully contributing to the delivery of strategic projects and developments in the area. The SDPA welcome the recognition given to its partnership working and innovative approach to facilitating the ambitious scale of development planned for the North East.